The next point in my reflexology protocol to get rid of a cold fast is the sinus point. If your head is feeling stuffy, especially around your sinuses, this is THE point to massage. There are actually five reflexology points for the sinus on each of your feet, but since I’m probably overloading your brain as it is, let’s focus on the main reflexology point for the sinus. 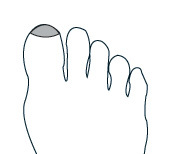 This point is located on the tip of your big toe on the UNDERSIDE of the toe as highlighted in the diagram on this page. I didn’t draw in toe pad lines (looked too messy and I was a little too lazy), so it’s easy to think that this might be an illustration of the top of your foot. I want to emphasize again, that the sinus point is located on the BOTTOM of your big toe. As you get to know me, you’ll discover that I’m really bad at coming up with metaphors for describing reflexology massage techniques. The first few iterations are usually inappropriate and I need several attempts to come up with something that I can use in a formal class. Since I’m blogging, you won’t get the benefit of the best in class metaphor. So for today, imagine that you’re crushing dried oregano between your fingers to sprinkle on a pasta dish. Use your thumb and forefinger to pinch and rub your big toe. Big thumb against the pad of the big toe. Do this for about 30 seconds. I came up with some other metaphors to describe this technique, but they definitely fall into the inappropriate category. I’ll share them with you because they made me laugh and laughter is always good medicine. Hopefully, these metaphors will also help you get a better understanding of the technique. Read on for the third reflexology point to help alleviate an achy stiff neck and tame a burning sore throat. Please note that I can’t promise there won’t be more lame metaphors. I’m a full time mom so I promise that you won’t get tons of email from me as I’m much too busy looking after my toddler. I also promise to keep your email address confidential and to only send you messages that are full of useful and invaluable information. Thank you again! Your metaphors are not lame. They do help explain the steps. Your writing is relatable and I enjoy reading it. Hi Holly- I had totally forgotten about reflexology with which I am familiar since my mom used to teach it in the Philippines for a long time. Luckily I came across your site just now while researching remedies for my severe cold and cough,swollen tonsils,itchy eyes-THE WORKS! Thanks so much for the info you provide .I love he way you explain things including your metaphors which are on spot! Thank you! Glad to hear you are feeling better! I came down with a whopper of a cold Tuesday morning, checked your website to see what you recommended for colds, and found this series of articles. I immediately began massaging the points, and by the next day most of the symptoms were gone! The turnaround was impressive. As you recommended, I’m continuing to work with these points for a few more days even though I feel much better. Thank you!